Avocado and Its Different Breeds - AvoSeedo - Grow your own Avocado Tree! Little did Spanish explorers know that their explorations to new lands would also lead to the worldwide spread of a fruit. Originally grown in the Caribbean and Central America, the avocado was a staple food among the locals but a surprise to the Spaniards. They were awed by the sight of a large green tree with a creamy fruit, something they had never seen before. It was the taste that blew their minds and soon the avocado spread to corners of the world such as Indonesia, Australia, Mexico and elsewhere. Though it arrived much later in California, the place is currently known for its production of different varieties of avocados, Hass being the most common among them. Here are some of the different breeds of avocados and a few interesting facts about them. Hass – Let’s start with the most popular one. The flesh is fatty and the fruit is high in its oil content (20% or more). The tough skin becomes darker as the fruit begins to ripen and responds to slight pressure applied when between the palms. Its thick skin makes it ideal for shipping and its nutty taste makes it a typical produce of the West Coast. It is available between August and May and ripens between April to September, giving admirers a long time. Bacon – This medium sized variety is more available in areas with low winter temperatures, between latter part of fall and spring. The skin is easy to peel as it is medium thin and remains more or less intact in colour. The tree is medium in height and the fruit has a light taste. Fuerte – The fruit is green, the skin is medium and the tree is large and widespread. The pear shaped fruit tastes great but does not grow well in the coastal areas. The skin remains intact in colour even when ripe, does not shine and is easy to peel. Its ripening season is between December and May and it is available around July to October. Pinkerton – This medium spreading tree produces fruits heavily, which ripen from November to April. Its pale green flesh is covered with a medium thick, slightly pebbly skin which becomes deeper in colour with ripening. Mexicola – The shiny black skin of this variety is paper thin. The fruit is top notch and ripens between August and October. Its lightly fibrous flesh is rich in taste. Stewart – Similar to Mexicola in nature, this one’s thin skin becomes black on ripening. Its ripening period is between August and October. Zutano – This one is a season opener as it is available in the months of September. Its yellowish green, thin skin is a marker. The upright tree produces medium to large fruits. The flesh is pale green in colour and light in texture. It ripens between November and January. Wertz – This medium thick skinned fruit tastes good and the tree is great for backyards. Ripening season is May to September. Holiday – This brilliant tasting variety grows on a smaller tree and has a pear like shape. Its name is derived from the fact that it grows between Labour Day and New Years. Jim Bacon – Similar to Bacon, these trees are just more resistant to frost. The flesh is creamy and the skin is green. Ettinger – This variety has a thin, smooth green skin and light green flesh. It bears resemblance to Fuerte and is found largely in Israel. Lamb Hass – This black skinned variety is a cross between Gwen and Hass. The high yielding tree stays upright and produces good quality of fruit. It ripens between April and November and has a nutty taste. Sir Prize – Another variant of the Hass, this ripens earlier, in winter. The upright tree is resistant to frost and produces a fruit which does not oxidise when kept cut. Gwen – Slightly bigger in size than Hass, this plump fruit has a golden green flesh. The skin is pebbly but comes off easily. Reed – The round shaped avocado is available in the months of summer and fall. It has a medium seed, thick green skin and a creamy flesh. 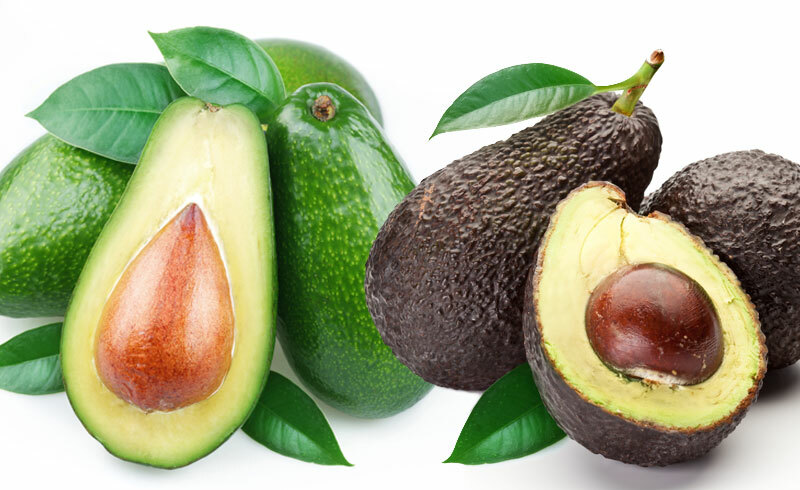 There are other varieties of avocados too which include – Carmen, Maluma, Shepherd, Tonnage, Macarthur, Hall, Choquette, Anaheim and more. This entry was posted in All about Avocados and tagged Avocado, Bacon, breed, Ettinger, Fuerte, gwen, Hass, Holiday, Jim Bacon, Lamb Hass, Mexicola, Pinkerton, Reed, Sir price, Stewart, Wertz, Zutano.